Somewhere down the line, Disney and Lucasfilm decided that “Star Wars” devotees wanted to keep seeing how the sausage was made. Evidently, even after the 1999, 2002, and 2005 prequels and 2016’s “Rogue One,” there are so many more stories to tell from “a long time in a galaxy far, far away” that will exist as stand-alone installments in the unofficially named “Star Wars Anthology.” Billed as an origin story for Han Solo before he met Luke Skywalker and Princess Leia, “Solo: A Star Wars Story” hits its marks well enough in connecting the dots but doesn’t add much to the ethos of the galaxy. It could be that the success of this prequel lives or dies on whether one is a diehard clamoring to see the process of already-established characters and catch every Easter Egg or just a casual “Star Wars” fan who gets more satisfaction out of the sequel trilogy. No matter one’s knowledge of what is to come in later films, where this particular story leads in bridging the gap between George Lucas’ original trilogy and prequels is tepid at best. Watchable for a single viewing but too slight for much replay value, “Solo: A Star Wars Story” is a sometimes breezy space adventure, albeit one that is sometimes plodding and muted without as much personality as the Han Solo we all know and love. Living on the lawless, bottom-feeding planet of Corellia, street urchin Han (Alden Ehrenreich) yearns to escape with his girlfriend, Qi’ra (Emilia Clarke), and fly among the stars. The couple does, indeed, escape, but when they try trading a vial of rare hyperfuel called coaxium in exchange for their freedom on an outgoing transport, they are separated. 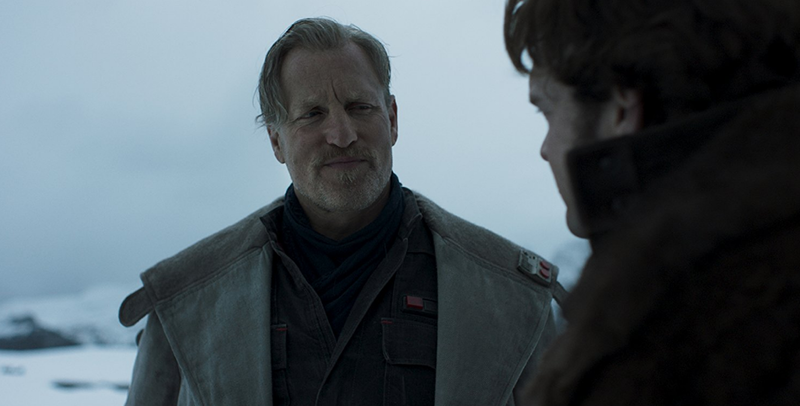 Three years later, having been kicked out of the Imperial Academy for not following orders, Han falls in with a crew of smugglers, led by Tobias Beckett (Woody Harrelson) and wife Val (Thandie Newton), to pull off a dangerous score. 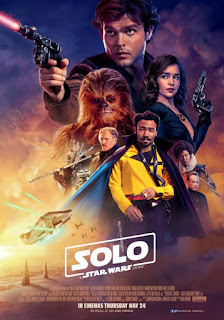 Along the way, in his hopes of reuniting with Qi’ra and ultimately restoring peace and prosperity to the galaxy, Han will meet a furry Wookiee named Chewbacca (Joonas Suotamo) and become acquaintances with gambler and pilot Lando Calrissian (Donald Glover), but he will also find himself indebted to Crimson Dawn crime lord Dryden Vos (Paul Bettany). If “Rogue One” explored how the Rebels stole the Death Star plans, “Solo: A Star Wars Story” finally answers all of the burning questions “Star Wars” fans might have had about Han Solo. How did he get his last name? How did he and Chewy meet? How did Han win the shiny and new ship, the Millennium Falcon? And how exactly did Han make the Kessel Run in less than 12 parsecs? Every answer is mildly fun for recognition’s sake, but these are highlights in a story that isn’t terribly compelling and more like a series of events. 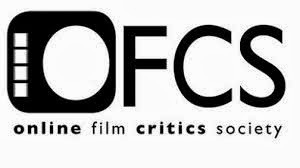 As directed by Ron Howard (2016’s “Inferno”) and co-written by father-and-son Lawrence Kasdan (“Star Wars: Episode VII - The Force Awakens”) & Jonathan Kasdan (2007’s “In the Land of Women”), the film constantly searches for a reason for being, however, at least in one element they get right, there is actual emotional investment in seeing Han’s inevitable reunion with Qi’ra and how their relationship will change, given their time apart. Perhaps Anthony Ingruber might have nailed the look of a younger Harrison Ford since he already did so in 2015’s “The Age of Adaline,” but Alden Ehrenreich (2016’s “Hail, Caesar!”) is not doing a Harrison Ford impersonation. Although it is a tall order to take on the iconic role, Ehrenreich solidly fits as a likably cavalier counterpart to the lovably cynical scoundrel Han Solo would grow up to be when introduced in the Mos Eisley Cantina. Seamlessly sliding into the role that Billy Dee Williams originated, Donald Glover (FX’s “Atlanta”) is Lando Calrissian with a charismatic swagger and various cool capes. 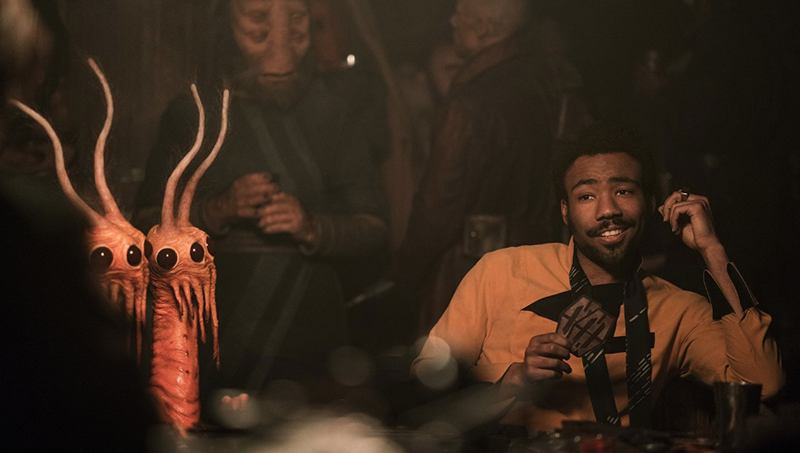 When this character enters the picture, Glover provides a welcomely rakish and cheeky energy that begs one to question why Lando didn’t just get his own origin story instead. Integral supporting roles are supplied by the magnetic Emilia Clarke (2016's "Me Before You"), making a lasting impression as Qi’ra, who’s enigmatic but still faithful to Han; and Woody Harrelson, sharp as always as Beckett, telling Han to trust no one but not fully trustworthy himself. Thandi Newton makes her too-brief screen time count as the fierce, not-having-it Val, and once she’s gone, droid L3-37 takes the baton. Phoebe Waller-Bridge is a fantastic scene-stealer, voicing Lando’s snarky, robotic sidekick, who speaks her mind about being fed up with not receiving equal rights. 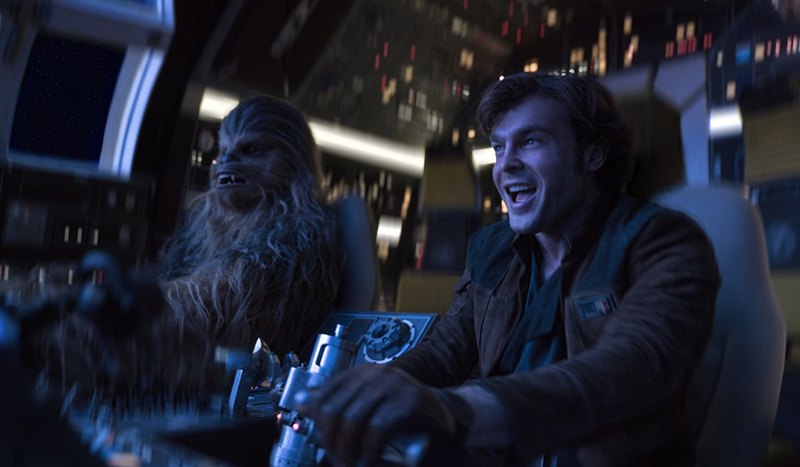 Though it’s unfair to speculate what the fired Phil Lord and Christopher Miller could have done before director Ron Howard took over mid-production and received final credit, there is the gnawing feeling that “Solo: A Star Wars Story” could have been more daring, more exciting, and better overall with more spark and devil-may-care personality in tune with Han Solo himself. As is, the to-and-fro journey is pretty safe and workmanlike without too many surprises, unless one has never seen a “Star Wars” movie before. The banter is fun and amusing, although there are as many times where the levity either comes off flat or forced, and maybe that’s the result of Howard being such a sincere filmmaker. There are a few rip-roaring but not exactly memorable action set-pieces, the most adventurous being the film’s opening escape from Corellia and then a train robbery along a snow-capped mountain. 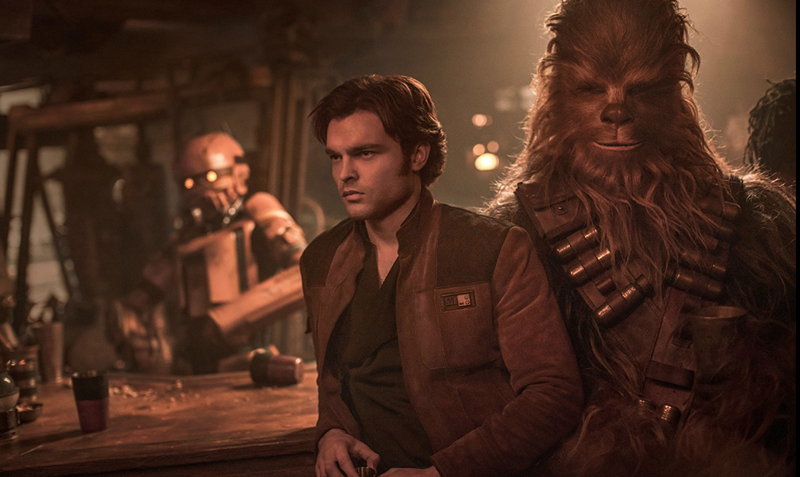 Based on “Solo: A Star Wars Story,” one isn’t so sure that it needn’t to exist, but it exists and gets the job done just fine. 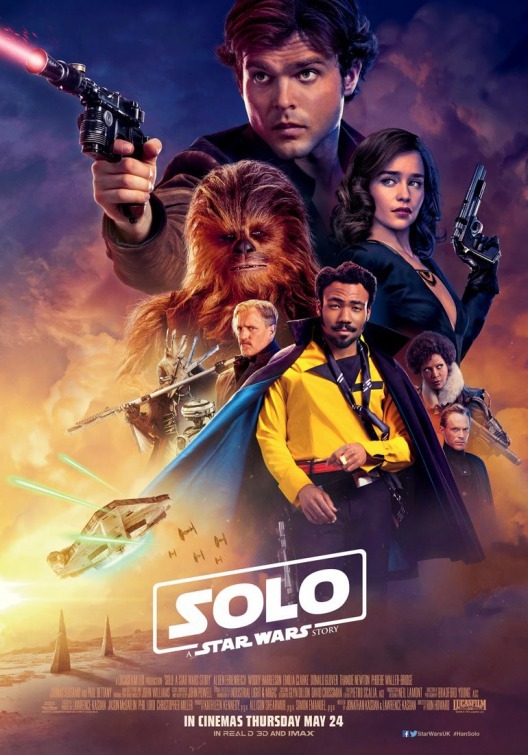 As the beginning of more episodic outings with Solo, it is recommendable to fans, but there is definitely room for improvement.